For many heat waves, there are also important feedbacks that come into play that amplify drought and heat and set the stage for wildfires. There is a direct local contribution to the drying and high temperatures in the absence of evaporative cooling.1 While heat waves with high humidity are oppressive and give no relief at night, heat waves often form in association with drought. In these cases, the prevailing dry conditions set the stage for the heat since the land is dried out, the vegetation is wilted, and all of the heat from the sun goes into raising temperatures, whereas ordinarily, in the process of evaporative cooling, surface water or wetness acts as an evaporative cooler (swamp cooler) of sorts. Some extreme examples have occurred in recent years in south Australia in January 2009, in Russia in summer 2010, and in Texas and Oklahoma in summer 2011. The record high temperatures in each case, along with the tinder dry conditions, led to extensive wildfires that were extremely costly in terms of lives, structures, human dislocations, and costs.2 3 The exceptionally warm March in the U. S. is but part of record warmth for the first five months of the year (see Figure 8 below) and, along with an absence of snow, the rapid snow melt has left the Rocky Mountains almost without snow by 1 June 2012. The very hot and dry conditions throughout the Southwest and Rocky Mountain Region have led to exceptionally high risk of wildfire. Multiple wildfires have already occurred, and several in Colorado and Utah have expanded into huge burn areas, resulting in loss of life and structures. As emissions of heat-trapping gases continue to rise, and global average temperatures continue to increase, we can expect even more of the of extreme heat and related impacts we’ve been witnessing in recent years. 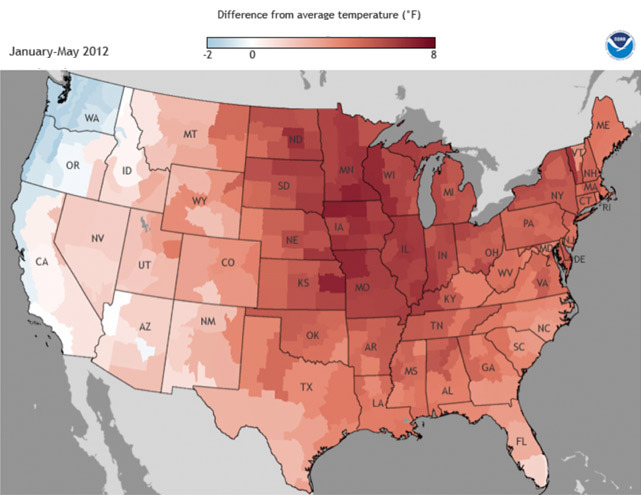 Figure 7: Difference from average temperature over the contiguous U.S., January – May, 2012. Source: NCDC/NOAA.